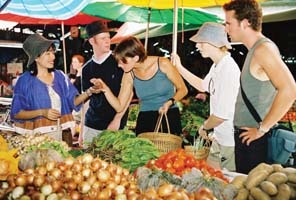 As part of our course of instruction we visit a local market to learn about local exotic fruits and vegetables. There are always an abundance of new things to see. Because we at Baan Thai care about the environment, we will only use baskets at the market, no plastic bags. At Baan Thai you will find that we use only the freshest ingredients purchased on the same day that we use them. Further, our cooking areas and utensils are kept well cleaned and are sanitized daily. In order for you to get the most out of your experience we also strive to keep classes small: the average class size ranges from 2 to 9 people, ensuring that our instructors have plenty of time to spend with you. Unique to Baan Thai is our Web based photo-album. Throughout your day at Baan Thai we will take pictures of you and your friends in action, shopping at the market and cooking in front of the Wok, etc. and post them daily on our website free of charge. That way friends and family can share in the fun too! Photos will remain posted for several months giving you the opportunity to download and save them for your own digital scrapbook. Also unique to Baan Thai is our web-based support network that can provide assistance to you long after you have returned home. No matter where in the world home might be, if you have a question about Thai cooking once you get there, you can e-mail us and we will provide a quick response. That way long after you have left Chiang Mai, we can help to ensure that you continue to enjoy success as a Thai chef. At Baan Thai our fondest hope is that you will join our family and start a cooking tradition of your own, which you can pass along to your friends and relatives.